Broken and overturned headstones rest against a tree at the edge of the Salem Revolutionary War Cemetery on Friday, Dec. 30, 2011. The restoration of the cemetery has been ongoing, though progress has been stopped due to lack of funds. Small placards mark the graves of Revolutionary War veterans at the Salem Revolutionary War Cemetery on Friday, Dec. 30, 2011. The cemetery holds the remains about about 100 Revolutionary War soldiers. The base of a tombstone remains in the ground with the top portion broken off at the Salem Revolutionary War Cemetery on Friday, Dec. 30, 2011. The restoration of the cemetery has been ongoing, though progress has been stopped due to lack of funds. A mounded vault sits near the stone wall at the Salem Revolutionary War Cemetery on Friday, Dec. 30, 2011. The restoration of the cemetery has been ongoing, though progress has been stopped due to lack of funds. 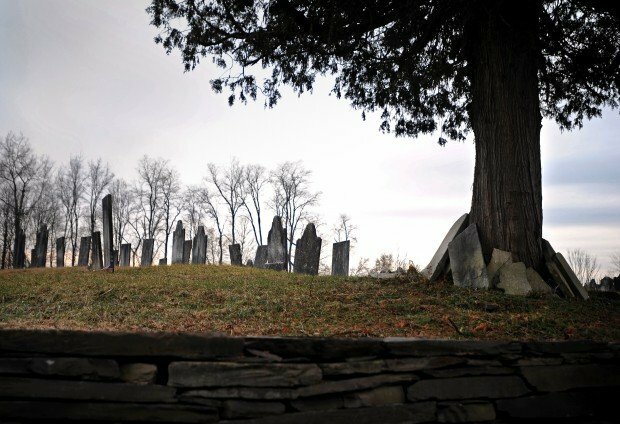 SALEM -- A project that began in 2006 to restore a Revolutionary War-era cemetery has been halted by a lack of funds. The town is appealing to the public for support. 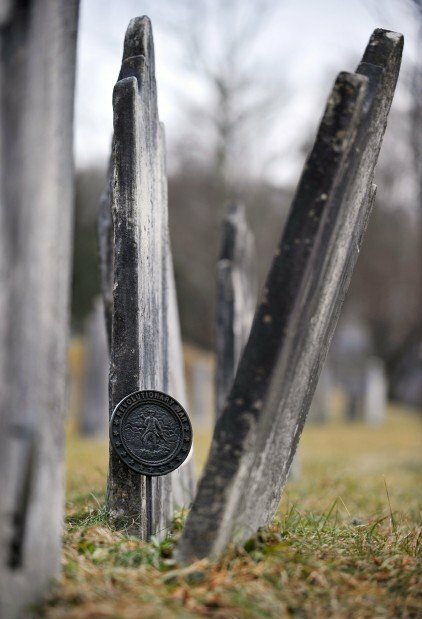 The Salem Revolutionary War Cemetery features the largest burial site in Washington County of Revolutionary-era soldiers. The earliest burial stone dates to 1769. "The first pioneers came here in 1761. They built their log cabins and when they brought their families from Pelham, Massachusetts, they felt they needed a burial ground, or else they would be burying people in their back yards," said Al Cormier, historian of the town of Salem. "When the Revolutionary War broke out in 1776, people who served in the militia at the time were buried there. There are 105 Revolutionary War soldiers buried there and that's how the cemetery eventually got its name," he said. The cemetery features about 1,044 gravestones, nearly three dozen of them carved by the popular 18th-century Vermont tombstone carver Zerubbabel Collins. In 1810, a stone mason was hired to build a stone wall around the cemetery to protect against theft of the tombstones and those buried beneath them. "It was against the law to exhume the bodies, however doctors who were in medical school needed cadavers and the only way they could do this was to pay someone to exhume a body," Cormier said. "They put up the wall with the hope it would deter things like that from happening. That's the original wall, which has over time deteriorated," he said. About $40,000 was secured through state grants and private donations and in 2006 restoration work began inside the cemetery to repair broken tombstones, walls and gates. A stone mason began work on the 1810 exterior stone wall enclosing the cemetery, but only got halfway through the project before work was suspended because of the lack of funding. "The funds raised a number of years ago have petered out and we stopped in the middle of the wall. We just ran out of money," said Cormier, who estimated the balance of costs to complete the project at $6,000 to $8,000. The old cemetery is popular with historians and genealogists. Architecturally, the sod-covered burial mounds are reminiscent of Scottish and Irish cemeteries, illuminating the origins of the early settlers of Salem, who brought the traditions of their homelands to North America with them. Donations for the "cemetery fund" may be made out to the town of Salem and addressed to Al Cormier, town historian, P.O. Box 458, Salem, NY 12865. Is there a way to give something back to people who donate? Use a kickstarter like model? I know it sounds silly, maybe even rude, maybe you wouldn't have to give anything in return, Maybe just online fundraising. Allow donations go to certain projects so they feel like gave something specific with their money, like rebuilding a wall, replacing a fence, repairing a gravestone? Make sense? Wow....it's not only about the "people who live in Salem" that should care. ATHEIST.....where is your pride for the USA. This is to preserve Revolutionary War Veterans. Come on.........think before you type!!! In stead of using "grant" money (another word for tax money), if the people of Salem care that much then be a good community and bond together with volunteers to preserve this site. Why do we people feel the need to have the government take care of what's ours? The hidden legend story about the Salem Revolutionary War Cemetery has no truth in it to the Salem historian's knowledge. Please do not dig in the cemetery. There's a legend that an old pirate haunts that graveyard, guarding a coffin full of plundered treasure. I suggest the workers dig up the graves until they find it. When they do, their troubles will be over.